Rich Layton thought his musical days were behind him not too long ago, his long musical career sabotaged by the inner ear condition tinnitus. “One night I’m on my knees praying in Kansas City because I’ve got jet engines in my ears at the Grand Emporium playing with Johnny Reno and the Sax Maniacs,” Layton recalls over coffee at his home in Portland. After years of battling the condition and thinking several times that he’d never perform again, Layton had surgery last December in a last ditch attempt to restore and preserve his hearing. So far the results have been encouraging and he remains optimistic that he can continue playing and recording music with his unique harmonica style, which can best be described as rhythm harmonica. Like many who start in the field, Layton first turned to music as an escape. After a move to Texas during his junior high school days, Layton would often come home and fire up the record player and sing along to the sounds of the Raiders or Animals. One day he heard a knocking on his bedroom door while belting out tunes and was surprised to find that his mother had let some of his friends into the house. They said they heard him singing as they were walking by and wanted to recruit him to sing in their band. In what foreshadowed his incredible timing throughout his career, Layton and friends entered a combo contest during the summer of 1967 that was judged by The Moving Sidewalks, the first band formed by Billy Gibbons, who went on to fame with ZZ Top. 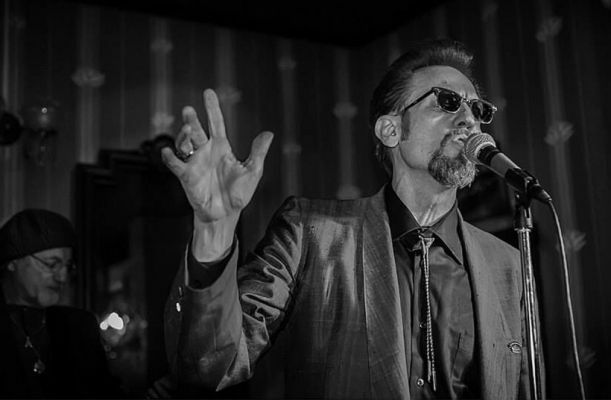 Since those early beginnings, Layton has been blessed to perform, tour and record with such luminaries as Lyle Lovett, Dave Alvin, Alan Haynes and Rocky Hill. You can also add Lucinda Williams to that list. Layton had recently transferred to the University of Texas when he met Williams. “She came over for dinner one night and didn’t leave for two years,” he recalls. In those early days of her career, the two would play together on street corners in Austin along a strip called The Drag, a large open area across from the university. Layton and Williams began getting bookings in clubs, but eventually parted ways professionally, though they remain close friends. Layton’s initial forays into bands only involved singing. An early bandmate once pointed out to Layton that all of the other band members had expenses in buying amps, strings, and instruments. The conversation spurred Layton into learning to play something other than a tambourine and he settled on the harp. In 1985, Layton was named one of the top six harmonica players in Texas. Despite such accolades, Layton never quite found himself in a position where one of his bands got the elusive big break. The toll from being a not-quite-there-muscian finally forced Layton to reconsider his approach to music. “I had a day job, then I’d have a happy hour, go play at night, sleep for five hours and go back to my day job. I’m starting to hate music because I’m starving from it,” he says. Layton and his wife moved to Portland in the 1990’s after falling in love with the area, but it took some time for him to find his feet in the local music scene. Buckwheat Zydeco finally spurred him into action about ten years ago when he asked Layton why he didn’t have his own band going in Portland? Layton’s current band is called Rich Layton and The Troublemakers. Layton handles harmonica and vocals, Larry McCoy plays electric guitar and vocals, Joanie Formoso acoustic guitar and vocals, Bill Dutkovic drums, and Robert Lefebvre bass. In addition to various festival and event appearances, the band regularly plays at The Lehrer and McMenamins’ Rock Creek Tavern. Based upon the band’s popularity in the Portland area, Layton seems to have finally found the model that works for him. And that’s pretty much any musician’s dream.